The family of Lt. Joe Gliniewicz, the now-disgraced Fox Lake police officer whose “carefully staged suicide” appears to be an attempt to cover up years of criminal activity, was experiencing serious financial problems around the time police allege the officer started an elaborate embezzlement scheme. NBC 5 Investigates obtained court records that show six years ago, Gliniewicz’s wife Melodie had maxed out her credit cards and stopped paying the bills. The credit card companies went after her in court, filing at least three separate lawsuits. In 2010, Melodie Gliniewicz was ordered to pay Citibank more than $7,000. That same year, she agreed in an arbitration hearing to pay more than $13,000 to Chase bank. In total, she was required to pay back more than $22,000. Despite the financial struggles, however, police say the family traveled extensively in recent years. The family of Lt. Joe Gliniewicz, the now-disgraced Fox Lake police officer whose “carefully staged suicide” appears to be an attempt to cover up years of criminal activity, was experiencing serious financial problems around the time police allege the officer started an elaborate embezzlement scheme. NBC 5's Tammy Leitner reported. On Wednesday, investigators revealed that a months-long investigation into Gliniewicz’s death determined the once beloved officer had “carefully staged” his suicide to make it seem like a homicide, revealing that his death came after roughly seven years of stealing and laundering money from the village’s Police Explorer Post. Detectives later revealed Gliniewicz also tried to hire a hit-man to kill the village administrator who was looking into the program’s finances. Investigators allege the thefts totaled hundreds of thousands of dollars, but have not given an exact number. “Those monies were used exclusively by Gliniewicz for personal expenditures,” said Lake County Major Crimes Task Force Commander George Filenko. 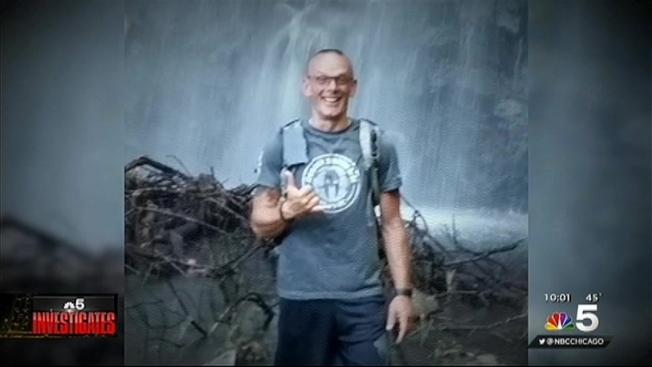 Law enforcement officials told NBC5 Investigates that the family’s vacation to Hawaii last year was funded with money Gliniewicz is believed to have stolen from the explorer program. 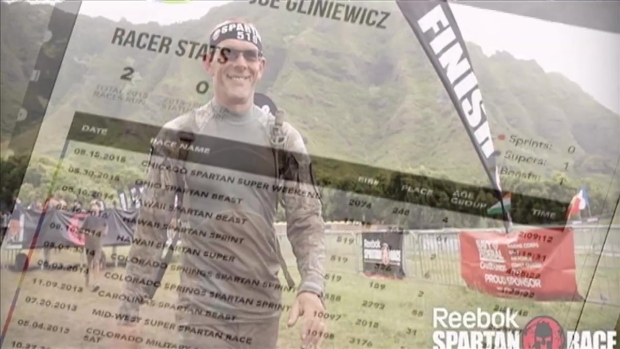 NBC 5 Investigates also learned Gliniewicz traveled the United States competing in extreme sports competitions and often taking his wife along. It’s not known at this point if these vacations were funded with what police are saying was stolen money. But law enforcement believes Gliniewicz used stolen money for his personal benefit. 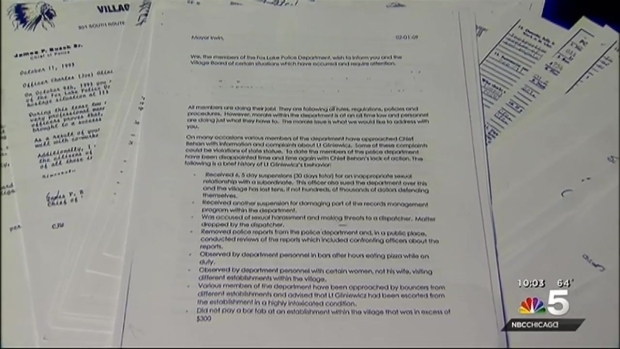 Lt. Joe Gliniewicz’s personnel file going back to the beginning of his career in Fox Lake reveals the beloved officer -- who officials say tried to hire a hit-man to kill a village administrator -- had been accused of a litany of offenses. Tammy Leitner reports. Gliniewicz's wife and son are also under investigation in the case, a source close to the investigation told NBC5 News. No charges had been filed as of Friday.